In this episode, Emily interviews Dr. Jenni Rinker, a mechanical engineering PhD currently working as a researcher at the Denmark Technical University. Jenni paid of $62,000 of student loans from her undergraduate degree while pursuing her PhD at Duke University. Her average payment was approximately $1,500 per month on a post-tax income of $2,700-$3,000 per month. Jenni shares her motivation for setting her lofty debt repayment goal and the practical strategies she used to accomplish it. After paying off her student loans, Jenni even saved enough money to take six months off from work post-defense. Dr. Jenni Rinker is a postdoc researcher at the Denmark Technical University. She attended Harvey Mudd University for undergraduate studies in engineering then went to Duke University for graduate studies. Her PhD is in Mechanical Engineering. 2:28 We’re talking today about your debt repayment journey. Can you tell us about this? After undergrad at Harvey Mudd in 2011, Jenni had $62,000 student loan debt. She set the goal to repay the full debt during her PhD. She accomplished this goal, paying off the debt in 3 years and 7 months. 3:48 Can you tell us more about what kinds of loans you had? Jenni kept a spreadsheet, a valuable tool that she used to track her debt repayment. She only had the option of unsubsidized student loans because she comes from a middle class household. At the time she started graduate school in September 2011, Jenni had $62,00 total from nine different loans. Federal student loans from Sallie Mae and Nelnet made up $28,000, at 6.8% interest rates. Jenni’s private student loans came to $34,000 total. Her single largest loan was from Alaska Advantage, a loan of $8,500 at 7.3% interest. She had several low interest (3-4%) private loans from Wells Fargo. 5:54 What was your income during your PhD? 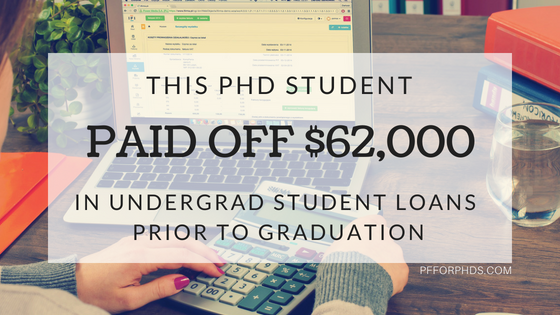 Overall, Jenni’s post-tax income varied from $2,700 to $3,000 per month throughout her PhD. Before she started graduate school, Jenni was awarded the National Science Foundation Graduate Research Fellowship. This fellowship provides an annual income of $34,000 for 3 years. When she started, Duke University offered her income in addition to her NSF fellowship. After the NSF fellowship period ended, Jenni won another external fellowship through the Office of Science that offered $3,000 per month. However, Jenni started graduate school in debt and did not have any savings or assets she could use to reduce her debt. 10:50 Why were you so determined to pay off student loans during grad school? Although student loan repayment could have been deferred while she was in graduate school, Jenni was uncomfortable with debt and letting interest accrue. She thought that keeping the debt would limit her choices after graduate school. The student loans felt like a weight over her head that was growing every day, and she wanted the freedom that would come after debt repayment. Jenni decisively started paying off her student loans as soon as she started graduate school. She saw that her income was higher than her monthly expenses, so she made it her priority. 13:53 How did you pay off your student loans? Jenni committed to her financial philosophy that the money earned from her job goes to rent, utilities, food, loans and other essential expenses first and foremost. Money for her other interests had to come from side income. Jenni earned extra income as a technical copyeditor. She had private clients and worked for the American Journal Experts. She funded several trips from her side income. Spreadsheets were Jenni’s most important tool. She had a spreadsheet for each year, where each month had a tab. She calculated that $1,300 per month needed to be budgeted for student loans in order to pay off the debt in 4 years. Her living costs, the “monthly nut,” were $800 to $900 per month. She kept frugal habits, such as rarely going out to dinner. Jenni implemented the strategy of paying herself first. Right after receiving her paycheck, she made her loan payment so the $1,300 was out of her account immediately and she wouldn’t be tempted to use it elsewhere. However, Jenni paid her student loans instead of building up her emergency fund, which was drained after she needed a car repair. Jenni paid her loans manually, so she could pay the highest interest loans first. Her biggest loan also had the highest interest rate, so she prioritized this one first. Though she had nine different loans, she focused on paying off one loan completely before paying towards another loan. Her story is an example of the debt avalanche method. Jenni prioritized bigger loans with higher interest to pay off first. She was motivated by paying as little interest as possible. This is in contrast to the debt snowball method, where a person pays off the smallest loans first, to feel motivated by these easy wins. Jenni also identified where she overspends. She would take out cash to be more aware of her expenses. 28:23 Did you have any speed bumps during your debt repayment journey? Though Jenni had one instance where she paid for car repairs, she feels like she got lucky with no major financial setbacks. Paying her student loans was her highest priority, and she ended up paying about $1,500 per month on average over three years and seven months. She paid her loans back faster than she expected. 29:53 How did you feel after paying off your student loans? Did anything change in your life? Jenni realizes that this is an unusual accomplishment. She posted on Facebook and got many congratulations. At the time she made the final student loan payment, Jenni was still working on her dissertation. She was so used to immediately using $1,300 for student loans, that she started saving that amount each month for travel. After she defended her PhD, she had stress-free travel for 6 months. She went to Patagonia, Europe, and traveled around the United States. Jenni already had a job lined up, so her travel was a true vacation to celebrate finishing her PhD and repaying her undergraduate debt. Jenni learned that traveling is very important to her, so this experience rejuvenated her and put her in the right mindset to start her postdoc. 34:30 Is there anything you wish you had done differently? Jenni wishes she had rebuilt her emergency fund after she drained it for her car repair. Overall, she’s satisfied with her debt repayment journey. She balanced frugality with having a good quality of life. During debt repayment, Jenni allowed herself flexibility for how much she paid every month. In the beginning, her repayment was more aggressive but she relaxed as time went on. She knew that in an emergency, her family could support her and she could pay her parents back for financial help in a tough situation. 38:14 Did this experience affect how you approach personal finance? When Jenni moved to Denmark, she stopped tracking her daily expenses so carefully and has allowed herself to indulge in treats and go to cafes. However, her budget spreadsheet is still her most valuable tool. She created her own spreadsheet template that makes sense to her. Jenni briefly considered using software budgeting tools like Mint, but never ended up trying one out. By using her own spreadsheet that she updates manually, she feels like she has more control of her budget. This manual system forces her to actively consider how she’s spending her money. 43:00 What advice would you give to someone starting graduate school with student loans? First, Jenni recommends that graduate students with student loans set realistic goals. Your income must be more than your expenses, and you still need to have a good quality of life. Figure out your “monthly nut” and compare it to your income. Then, identify your problem areas in your expenses. Second, she encourages graduate students to reevaluate their financial strategies. As graduate students, we have to educate ourselves about finance and learn from our mistakes. If your financial strategy is unsustainable, you can change it. Jenni’s inspiring story is applicable to anyone in any kind of debt repayment scenario. The financial strategies Jenni used can help graduate students pay off their own student loan debt. 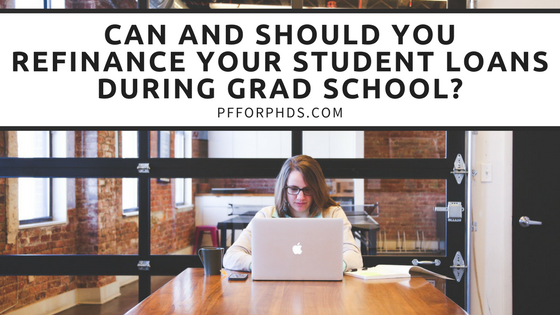 Can and Should You Refinance Your Student Loans During Grad School? One of the most talked-about topics within personal finance in the last several years is student loan refinancing. Student loan refinancing is taking out a new private student loan and using it to pay off your old student loan(s), federal or private. The student loan industry is being disrupted by traditional banks, peer-to-peer lenders, and technology companies. Combining those new players with the current low interest rate environment has produced incredibly low-cost alternatives to the standard student loans that have been issued over the past decade or so. Current graduate students with student loans from undergrad or grad school may be looking at these new options with great interest, especially because of pervasive advertising by one of the industry leaders. But is student loan refinancing advisable or even possible for graduate students? Below are several questions graduate students with student loans may be asking when exploring refinancing. Is the Refinanced Student Loan a Better Deal than Your Current Student Loans? First and foremost, you should only consider refinancing your student loans if another lender will give you a better deal than the one you currently have. This better deal will almost certainly be defined by a lower interest rate on the debt, although there may be other reasons to switch if the interest rates are close, such as locking in a fixed interest rate or lowering your monthly payment. If the new loan involves an origination fee (many do not), you must make sure that the decrease in interest rate justifies the up-front fee. When you take out any new debt, you must read the fine print associated with your loan very carefully. This is especially true for student loans, as even private lenders may offer a few perks not available for other kinds of debt, such as a grace period or forbearance. For refinancing student loans, you need to have a full idea of what both your current lender and your possible new lender are offering you so you can be sure you are not forgoing any relevant benefits. Can You Defer Refinanced Private Student Loans While You Are in Grad School? One of the major benefits of federal and many private student loans is the option to defer the loan payments while you are enrolled in graduate school. When your student loans are deferred, no payments are due, though interest will still accrue if the loans are unsubsidized. Deferment is likely one of the perks you want to preserve through your refinance unless your loan payment amounts will be so small that you can easily manage them on your stipend. Chances are that in-school deferment will be available if you are creating a new student loan, though you should carefully check on this with each lender you are considering, including possible limits on the deferment term. Should You Ever Refinance Federal Student Loans? If you refinance federal student loans, you will almost certainly give up access to the unique benefits that the federal government provides, such as flexible repayment and forgiveness. If you think there is a possibility that after graduation you will 1) need, based on your income, to extend your repayment term to lower your monthly payment or 2) both enter a career field (e.g., public service) that is eligible for forgiveness and want to take advantage of that option, you should probably not refinance your student loans at this time. That isn’t to say that you should never refinance federal student loans. If you are confident you won’t need any of the flexible repayment options, getting a lower interest rate on the debt now makes more sense than preserving the option to lower the monthly payments. The latter would almost certainly result in you paying more in interest on your loans both because of the presumably higher interest rate and the extended repayment term. Some federal student loans are subsidized, which means that the federal government is paying the interest on the loans while they are deferred. (Starting in 2012, all graduate student loans are unsubsidized, though subsidized undergraduate student loans are available to qualifying students.) Refinancing subsidized federal student loans means that the interest rate would go from effectively 0% to a higher interest rate; while the subsidized federal student loans are deferred, it seems unlikely that any private student loans would be a better deal. Can a Graduate Student Refinance Student Loans? As in any refinancing process, to get a good deal the borrower must have a sufficient income and good credit. Both of these requirements demonstrate the ability to repay the debt. Some lenders may have explicit minimum incomes and/or credit scores, while others may consider a more holistic picture of the borrower and the debt. The likely sticking point for graduate students is going to be the income requirement. In general, the most attractive refinancing offers come from lenders who require high incomes and/or low debt-to-income ratios. Graduate students with high debt loads who earn typical stipends will probably find themselves ineligible for refinancing until they start earning more money after graduation. However, it doesn’t hurt to check on the published minimum salaries or even apply for pre-approval from a few lenders (as long as the process doesn’t involve a hard credit pull) to see if you are eligible. While refinancing student loans to a lower interest rate is helpful, it is not a cure-all when it comes to surmounting your debt. You still have to actually work through the payoff process. One of the downsides to refinancing (or consolidating) student loans is that it gives you the impression that you’ve done something to get rid of your debt, when all you’ve really done is reshuffle it. But as long as you are still willing to pay down your debt energetically, either during or following grad school, and you are not giving up any relevant benefits, refinancing can save you quite a lot of money over the long term. Have you considered refinancing your student loans?